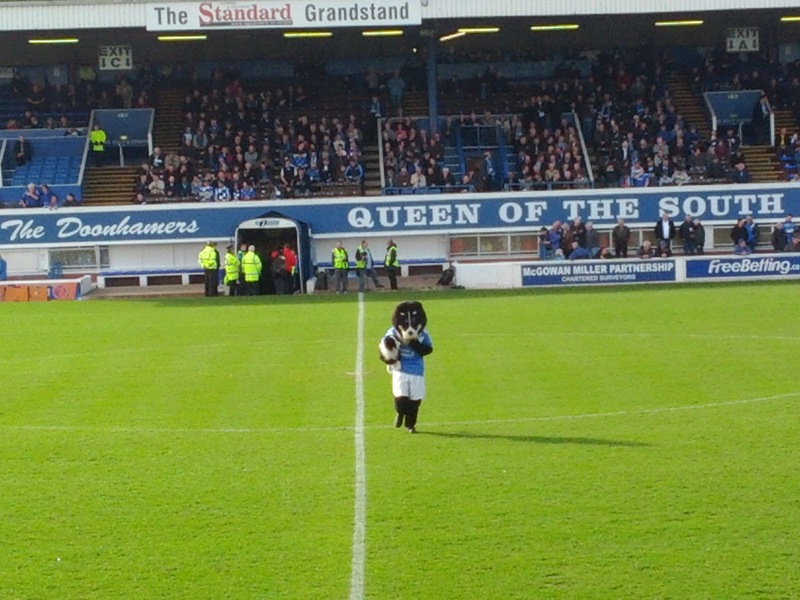 Does anyone know why the club are called Queen of the South? Well...it's because Dumfries, the town, is known as the Queen of the South - receiving its nickname from David Dunbar, a local poet, who stood for election in the 1850s who referred to the town as the "Queen of the South" in one of his addresses. Fast forward to 1919 and the decision to merge three local teams (Dumfries FC, 5th Kirkcudbrightshire Rifle Volunteers FC & Arrol-Johnston - a work's side for a car manufacturer) resulted in the creation of Queen of the South United (the United was subsequently dropped). Their home was to be Palmerston Park where they have played from that day until now. Approaching the ground was tricky, actually! I found the street (Terregles Street) but couldn't for the love of me work out where I gained access to the stadium itself! Needless to say, the parents looking at me sitting on the wall playing with my phone as their children played on their bikes around me seemed rather suspicious. Thankfully, I stopped looking like a great big pest and found my way. 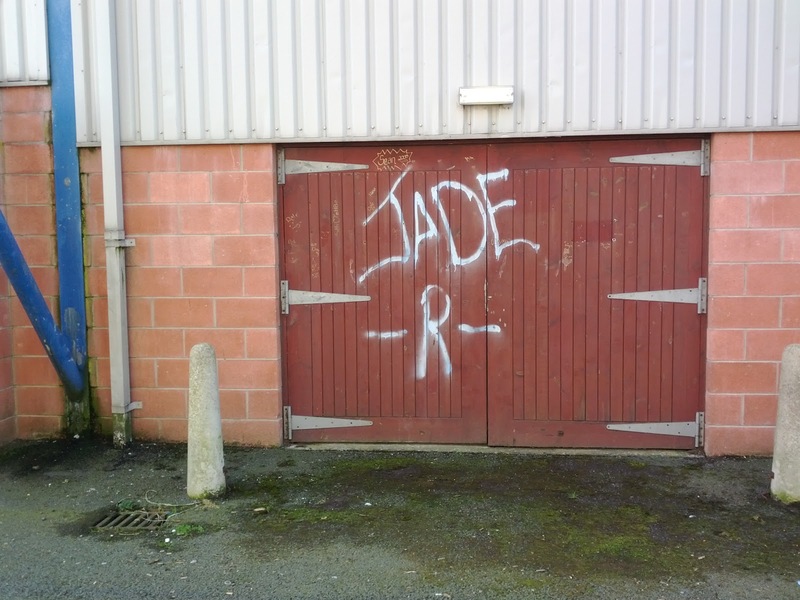 The first thing I noticed was that the outside of the East Stand was a hell of a lot of graffiti. 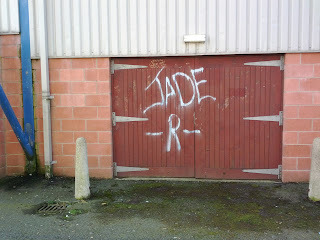 One girl, Jade, seemed to be intent on tarnishing every available space on the outside of the stand. Making my way into the ground, I immediately noticed that Queen of the South do really like a giant box. 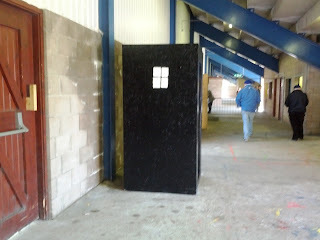 A box like a Tardis from Dr Who. A box like a crate that ships giant Ming vases. All sorts of boxes. Utterly bizarre. Keen to explore whether I'd be given my own personalised box, or if the customary seat would be offered, I made my way pitch side and was greeted by an absolute treat of a stadium. Truly from a different era, as one valued Twitter follower described it. It's a great looking ground, with a good blend of new and old, weird and normal. 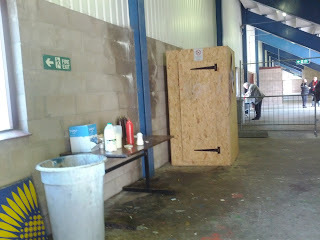 The stand I sat in is smart looking, new, single tiered and houses home and away fans. 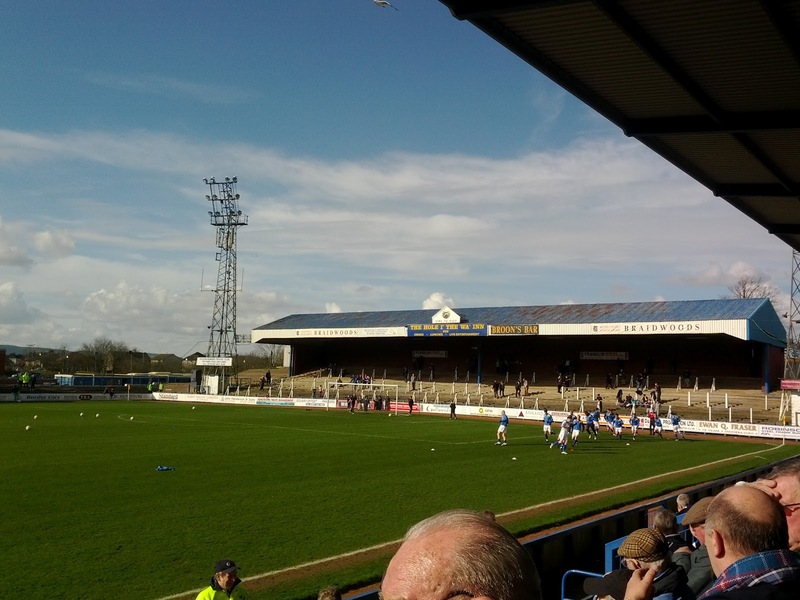 Opposite is the very traditional Grandstand, a classic looking covered seated stand that runs for about half of the pitch. On the right, as you look at the pictures below, is the Portland Drive Terrace - a huge terrace, that is reminiscent of what football grounds used to be like prior to the Hillsborough disaster. On the left is the Terregles Street end - a small and open terrace that is no longer in use and has fallen into disrepair. In terms of catering, I'm not going to lie it was pretty brutal. The pie and tea cost me £2.60 which in itself isn't too bad but for what you get I'd be expecting to be paid £2.60 to put myself through it. The tea tasted more like Cola - it was tea, I actually checked - and the pie was really quite greasy indeed. Good place to watch football, bad place to have your lunch. 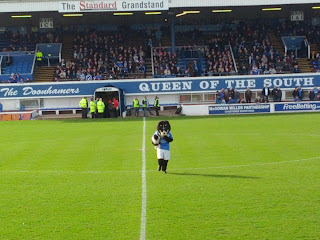 I have to start this section off by mentioning the Queens mascot - Dougie the Doonhamer - who is a human sized Border Collie. Ridiculously random! 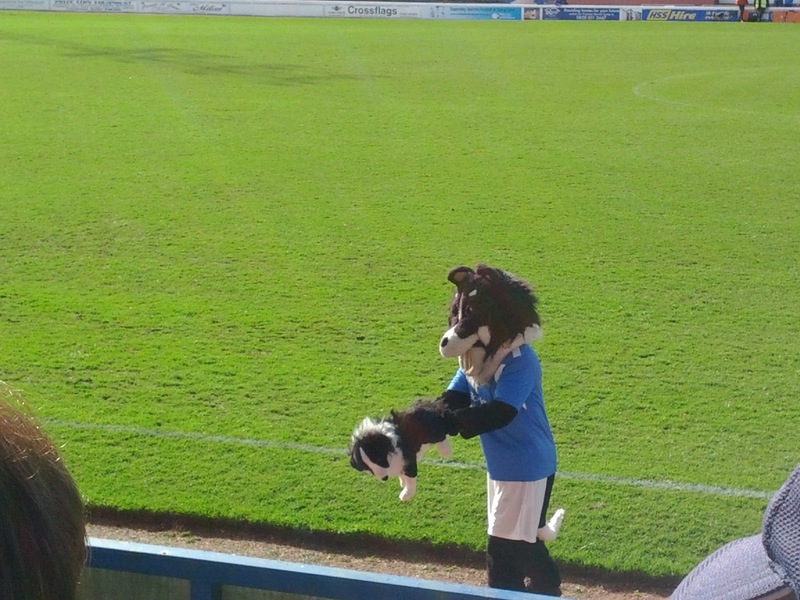 Even more random was that Dougie carried a dog-sized Border Collie toy around with him as he tried to rouse the fans. My favourite bit of all was when he placed the dog in the centre spot and walked away, giving it "stay....uh uh......staaaaaaaaaaaaay!" - Brilliant! 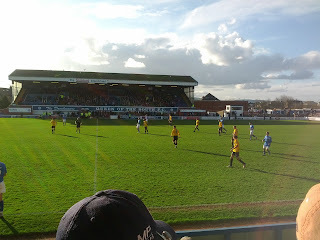 As for the fans, the Queens supporters were quite a nice lot really. I felt unbelievably sorry for them at times though. There was just an air of resignation about them from pretty early doors. Not in a grumpy, negative, horrible to be around sort of way. Instead they were just a bit down in the dumps about their team not playing well and being low on confidence. 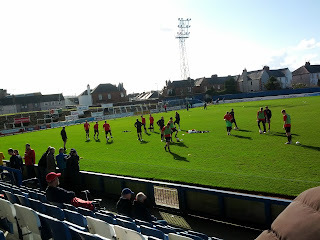 When they did get an opportunity to praise their team they certainly did so but much like Raith fans, when I went to visit Starks Park, they mostly sat in quiet disappointment at what was going on in front of them. Oh dear. I'm sorry Doonhamers fans, it was pretty grim stuff. I was reliably informed by a Queens fan that it was the worst they have been in a year and I can believe it. They were truly hapless on the day. Without any question of doubt, the biggest issue with the team is a lack of confidence. Poor Tam Brighton was a shining example of this. So often a decent player, his confidence is shot to bits - to the extent that he had to be hooked only 30 mins into the game. Across the pitch there was a sluggishness and a nervousness about Queens that resulted in a very hard day at the office as Partick took no prisoners, playing outstanding counter-attacking football and cutting the home side open with ease with almost each attack. A couple of the goals were certainly down to poor defensive mistakes. Others, due to easy loss of ball in midfield. Overall though, Queens lack of confidence meant that they became one-dimensional, playing it long to big Sam Parkin almost every time, bypassing the midfield who seemed to struggle regardless. Daniel Carmichael: When I saw Queens at Ayr in July, this boy came on after about 75 mins and did enough to convince me he was worthy of Man of the Match that day. Once again, I'm absolutely convinced of the boy's talent. He is extremely skillful, has quick feet, is strong for a little man and has a game intelligence that makes me think he could play for a better side in Division One. His final ball is, at times, questionable, but he was the only shining light on an otherwise terrible day for the home team. I paid £17 to get into Palmerston. Before I ordered and ate my pie and the game kicked off, it was worth it. After that, it sadly wasn't. Don't get me wrong, I actually enjoyed the game - Partick were superb and their counter-attacking stuff was a pleasure to watch - but for OTWRB purposes, the home team were a real let down. I'm sad to say I think Queen of the South might be looking at Division Two football next season and, hey, maybe they will find their level and actually entertain greatly. I hope so because as an arena, Palmerston was superb. The stuff on the pitch, however, doesn't merit a high score at all. Sorry guys!